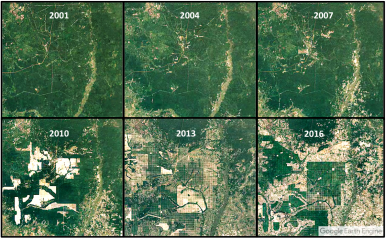 Cambodia did not take kindly to satellite images from NASA showing the extent of deforestation. At the beginning of the year, Cambodia’s Environment Ministry found itself in a quarrel with U.S. space agency NASA over forest coverage. Again, earlier this month, The Phnom Penh Post reported that data from the University of Maryland showed at 30 percent spike in forest cover loss in 2016 over the year before. And, again, the Environment Ministry accused the report of being politically motivated an accused The Post of “exaggerated” reporting. While attempting to put a stop to the damage caused to the nation’s forests, Cambodia’s government continues to spar with activists, journalists, and international organizations. The dictatorial line taken by the Cambodia authorities belies the reality that very real steps are being taken by the authorities to halt the rapid forest loss – albeit with varied rates of success. The government has appointed a special police force, enacted legislation, and begun working with the WWF, Wildlife Alliance, Wildlife Conservation Society, Fauna & Flora International, Conservation International, and Birdlife International. The crackdown on illegal lumber activities has shown success. As reported by the authorities last week, the Ministry of Agriculture and Fisheries uncovered 963 cases of illegally logged timber involving 2,663 cubic meters of wood. Despite the government’s efforts, however, much illegal logging continues in plain view, plagued by lack of enforcement and corruption. An official investigation in March 2017 alleged more than a dozen police and military personnel involved in a Vietnamese timber smuggling operation; seven Vietnamese nationals were also arrested. These arrests followed the seizure of 145 logs of luxury wood harvested in Mondulkiri Province. The deforestation and following concern for Cambodia’s greenery trace back to the period between 2010 and 2014, when economic land concessions were given for planting rubber trees, pepper, and other large-scale agriculture projects. Since then the success of government efforts have been difficult to gauge. Part of the problem is in calculating loss of forests; government data often includes plantations – which are far from conducive to Cambodia’s natural forest environment – as forest cover. One of the few ways in which foreign data is largely incomplete is having information on the ground; the data from the University of Maryland isn’t even Cambodia specific. Getting non-government sanctioned data, however, is both difficult and dangerous. Reporters have been arrested and activists face regular harassment. The supply chain for the illegal lumber smuggled out of Cambodia is fairly straightforward: from Cambodia to Vietnam, to China and elsewhere. China’s appetite for luxury rosewood – taken from Thailand as well – has been insatiable, and the risks of being caught are outweighed by the enormous payday. Non-profit U.S.-based Forest Trends estimates that imports of rosewood to China increased by 1,250 percent between 2000 and 2015. Despite harassment of activists and the detaining of journalists, the government does indeed want to stop illegal logging and two weeks ago approached Japanese via REDD+, the United Nations forest loss program, to help pay for data from U.S. satellites to get a clearer picture. Political and economic calculations in Cambodia, China, and Vietnam are contributing to widespread illegal logging.